Did you know this about Jacksonville, Florida? As any homeowner knows, heating and cooling bills can top the charts during the height of summer and winter in many parts of the country. Homes that are well insulated can aid in keeping bills in line by helping to keep temperatures at a constant – but there are additional ways to tackle energy bills, and increasingly popular solutions include solar energy. Depending on your climate and surrounding buildings, trees and topography, solar energy can be a resource that could be harnessed to lower your bill from the local electric company. In fact, many people are able to generate enough electricity and heat from the sun to power their home without the need for power from a utility company at all, and a few even manage to generate excess energy that they can sell back to the power company energy credits or for a profit. Contrary to popular thought, solar energy is not just for dry desert climates. Northern regions where summer days are long and often sunny have a distinct advantage: solar panels operate more efficiently at cooler temperatures. While the diffuse light of a cloudy day will not generate as much energy, there is still some benefit seen. And climates that have rain will also see benefits to maintenance, as periodic rains can help clean the collection panels. Passive solar homes use smart design and construction to capture energy from the sun and keep it within the home as heat when it is needed, and generally reject heat when it is not needed. With distinct features of southern windows and heat-gathering materials, passive solar homes don’t use mechanical systems to collect and convert energy into electricity, but rather use their environment to the best advantage and store heat in a thermal mass for distribution in the home over time. However, most people who are considering solar as part of their energy profile are seeking to outfit a more traditionally designed and built home to take advantage of sunny days to produce electricity for diverse use. There are three popular “active” systems for using solar energy that are of importance to homeowners – the first and most obvious is the type of system that is intended to generate electricity. This system, comprised of Photovoltaic (PV) collection panels, tracking mounts to move the panels to follow the sun, inverters, switches, wiring systems, and meters that work together to create electricity that is usable in your home and by others on the power grid. The second system worthy of note is a solar hot water heating system. These systems enable homeowners to use the power of the sun to heat water used in showering and cleaning. And finally, there are also solar heating systems for heating the water in swimming pools. To generate electricity, one of the biggest issues is where to mount the collection panels. In areas where land is at a premium, the roof is the obvious answer. Closest to the source of power (the sun) and usually unobstructed by trees, roof mounted panels can be unobtrusive and effective at the same time. However, professional installation is advised, and sometimes extra support is needed for the extra weight added to the roof. 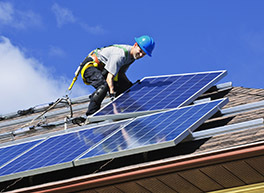 Often it is advised to replace the roof prior to installing the solar panels to reduce efforts later as the roof ages. If solar water heating is also being employed, a water tank would often be installed on the roof, close to the solar panels, resulting in even more weight. Again, these are often jobs that would be accomplished by professionals who understand the issues involved. Aesthetic issues may also be raised. Solar energy systems begin at the very beginning – first steps include having a site assessment followed by a design and planning period. Professional installation is desirable due to the load on the roof and wiring and electrical issues. Savvy homeowners can do their own maintenance and monitoring, though check-ups by the professionals might result in higher efficiency. There are some potentially off-putting financial considerations. Initial costs can be high, though State and Federal incentives and subsidies can bring them down. Choices during installation can be made that will lower the bill, so good planning up front will be a distinct advantage. Generally, it is wise to stick with simple, tried-and-true technology and a professional company with a good track record that specializes in sales and installation of quality products. Get recommendations and talk to homeowners who have been through the process as they can shed light on your concerns. On the Federal level — homeowners can get a Residential Income Tax Credit of 30% of the total cost of an installed system. This incentive is available until 2016 and can be “carried over” each year until it’s used up, or until time is up, whichever comes first. Some states offer no sales tax on solar installations, and even pay customers a base rate on the total energy produced by the system, regardless if it is used by the building or sold back to the grid. There are arguments against solar: Photovoltaic (PV) panels are created using quite a bit of energy, and they do contain heavy metals (cadmium), so they should be disposed of properly at the end of their life cycle. However, if they are maintained well, that could be 25 or 30 years from now. Systems are also costly to install, even with governments making them less expensive through incentive programs. Be sure to look closely at the installation and warranties offered by those doing the work; warranties offered by companies that are small may be worthless if the business fails. Additionally, stay on top of industry trends and know what you are buying: not all solar panels are made with the same quality, and the new, thinner PV sheeting seems to break down more easily, shortening its useful life, so you might want to consider whether or not to use it. In areas that are off grid, where solar systems are in use, there are also banks of lead-based batteries that serve as storage for power collected during daylight hours. These batteries are not environmentally friendly, and must be maintained and disposed of properly as well. These expensive panels of batteries may require replacement every 5 years. Solar water heating systems sometimes require the use of antifreeze in the system, which can be an environmental hazard so a good maintenance plan is desirable. Know how to maintain your system and what to do in an emergency. Keeping panels free of debris, dirt and pollen will ensure maximum production and keep the panels from deterioration. Everyone in the home should know how to disconnect the system from the house in case of fire, and how to disconnect from the grid power as well. A quality solar power system can provide many years of excellent service, reducing your electric bills, and enable you to be more self-sufficient. In addition to the benefits of lower power bills, homes that are efficient and whose owners have invested in quality systems are often valued at a higher rate. Remember to keep all records associated with the purchase, materials, installation, warranty and maintenance. 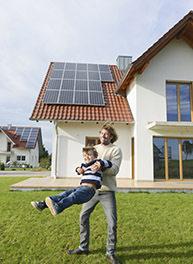 As buyers become more familiar with the benefits and use of solar power, these systems can set your home apart and make a difference in the sale. 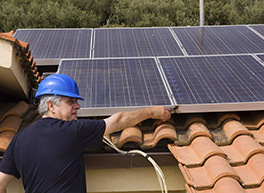 For additional information in understanding the basics of photovoltaic (PV) systems, http://www.dummies.com/how-to/content/the-basic-components-of-a-home-solar-power-system.seriesId-246926.html is a helpful resource.